Afghan Women Make Their Mark On The Soccer Field The women's soccer team in Afghanistan isn't an international powerhouse. 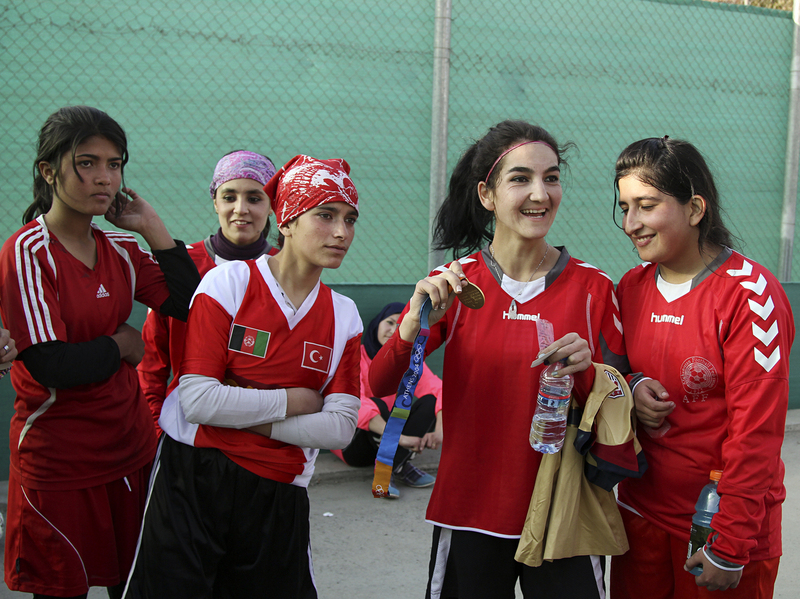 But their mere existence is a triumph and points to the growing number of Afghan women playing sports. And they're getting a little help from an American soccer star. Afghanistan first established a national women's soccer team just five years ago, and while they aren't yet World Cup material, they are making strides. Last week, they got a little help from former U.S. Olympic soccer player Lorrie Fair, who staged a clinic in Kabul that was set up by the State Department. Clad in her blue U.S. national team sweatsuit, Fair led the Afghan women through a series of exercises on the tennis court at the U.S. Embassy. Afghan soccer player Hadissa Wali holds the Olympic medal belonging to former U.S. player Lorrie Fair. "I'm constantly inspired by the things they do, because we're very lucky in the U.S. to have support for women's sports," Fair said. "We can't even grasp what they're going through. They're fighting an uphill battle." The Afghan team has been playing internationally since 2008 and has mostly competed against teams in the region, including Pakistan, Bangladesh, Nepal and Sri Lanka. There have been some rough defeats, like an 11-0 drubbing by India earlier this year. During the Taliban era in Afghanistan, women were barely able to leave the house, let alone play sports. But since 2001, women have been running, kicking and punching their way onto the international sports scene, including the Olympics. There are Afghan women playing soccer, basketball, volleyball and even cricket, though some still have to do it in secret. And they continue to face countless obstacles. "Some pretended to be boys when they were kids so that they could play," says Fair. "Others just kind of got together secretly. There are so many stories. Each person has their individual story. What they do have in common is that they do have a love for the game." Former U.S. Olympian Lorrie Fair hugs Zahra Mahmoudi, the captain of the Afghan women's soccer team. Hadissa Wali, 19, has loved the game since she started playing in fourth grade. "It was challenging. We practiced in school, and the level [of play] was really low, and we weren't able to practice well with the coaches that we had," says Wali, who dreams of playing in the World Cup and eventually becoming a lawyer. "It's quite important for me to play in the World Cup. I just want to play as a world player like [U.S. star] Alex Morgan," she adds. "I'm really a fan of her playing. That's my dream — to be like those players. Not that famous, just to play like them." The team captain is Zahra Mahmoudi, who was born and raised in Iran. Her family returned to Afghanistan in 2004, and she taught the girls in her neighborhood how to play. "It doesn't matter for us if we lose the game. It's not important for us. 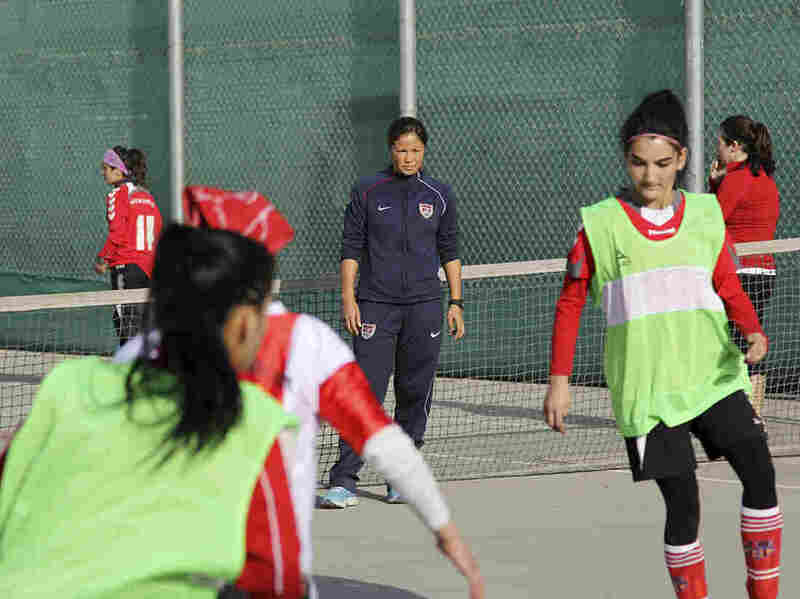 The [important] matter is being a team and existing, because being a soccer player in Afghanistan is a fight against the Taliban and all the people who don't want females to be in society or to work or to study," Mahmoudi says. Afghan society as a whole is still not accepting of female athletes. Many families don't want their daughters to face the security risks associated with being a female athlete, and women often lack resources and safe places to train. Still, many are persevering. Sadaf Rahimi is a female boxer who was planning to fight at the London Olympics. But, at the last minute, the International Boxing Association barred her from the games, saying she was overmatched by the competition and was in danger of injury. Instead, Afghanistan sent sprinter Tahmina Kohistani to London. She failed to advance beyond her initial heat, but she has vowed to promote women's sports in Afghanistan. Mahmoudi says her family supports her but worries for her safety. "It's very difficult [for me] and also for some of my friends," Mahmoudi says. "There are females who say, 'Please don't play soccer. It's for boys.' Because they have traditional minds." Still, she's hopeful about the future. "I'm studying coaching football now, and I hope in the future I can become a coach, because it's very essential for Afghan culture that a woman teach girls," Mahmoudi says. At the end of the clinic, Fair says the Afghan women taught her more than she taught them. "I can say that I'm definitely impressed," Fair says. "They're skilled, they're passionate. They're pretty courageous to even be here. If this country has a future, it's going to be in these women here, because they were pretty amazing."